Installing or replacing old shower doors can make a big difference in the look and functionality of your shower. When you begin to shop for your new shower doors, you will quickly see that there are many choices available. Many of these are style decisions, and of course, there will be decisions on what kind of ​glass you want—clear, fogged or etched. First, though, you should consider more basic questions of just what design style you're after. Bypass shower doors are sliding doors, operating in much the same way as a patio door. 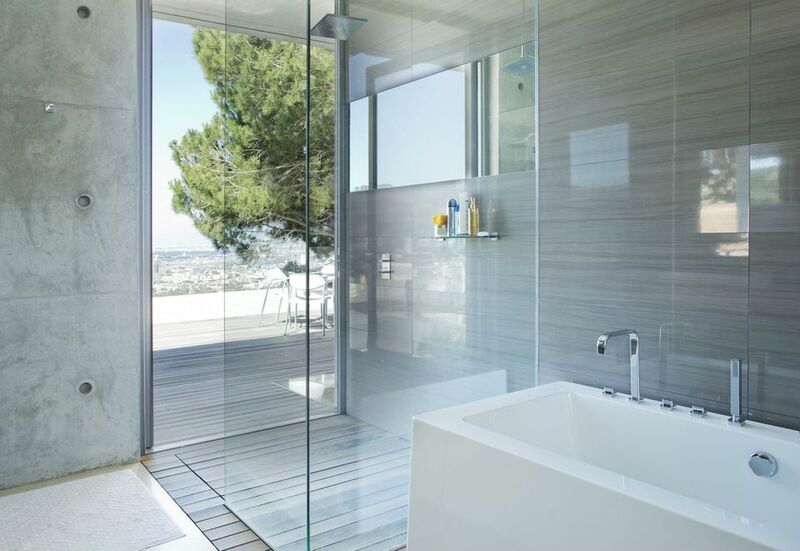 Typically, they consist of two sliding glass panels that roll on tracks attached to the shower enclosure. The doors may simply slide in the tracks, or there may be mechanical rollers that assist the movement. Bypass doors are used both on stand-alone showers, as well as the shower doors mounted on a bathtub in combination tub/shower configurations. Bypass doors make for efficient use of space since they require no space for the doors to swing out into the bathroom. A hinged shower door is a glass panel that opens by swinging in one direction on pivoting hinges, like a typical passage door in your home. The door hinge can be attached to a stationary glass panel or the wall or shower surround. This type of door is more common on stand-alone shower stalls, and it requires clearance in the bathroom for the door to swing. A pivot shower door is a swinging door that has a pivot hinge allowing the door to open in either direction. Pivot shower doors can swing 180° so they can open in or out. The pivot hinge can be attached on one side of the door, or it can be center mounted to create a revolving shower door. Pivot hinges are the design used on most ultra-modern curved glass shower doors. Bath screens (also called bi-fold or tri-fold doors) consist of several glass panels. Normally one glass panel is fixed while two other panels fold in on hinges, a screen panels do. In operating, they work much like the folding bifold doors on some closets, and they are used for the same reason that bifold closet doors are used—they make efficient use of space and do not swing out widely into the room space. For a small bathroom, a neo-angle shower door can be a real space saver, since a corner shower door configuration cuts across the 90° angle created by a corner shower. For this shower door, there are two smaller side panels running perpendicular to two side walls with the door centered between them. Usually, the door opens out into the room in a neo-angle door. A steam shower door design is intended to be steam tight from floor to ceiling and along all seams, allowing a shower to double as a steam room. To contain steam, the glass panels extend from floor to ceiling of the shower enclosure. ﻿The steam door design can be made of solid glass panels with a hinged door that has an air-tight seal on built in. Usually, a steam shower enclosure has built-in movable panels above the door, called transoms, that can be used as vents. Is Your Dryer Vent Pipe Safe and Legal?